The Proto-Flight Model (PFM) of the HXMT satellite passed the acceptance review on December 16, which marked the approval of the satellite design and the official launch of the satellite production. A panel of domestic experts reviewed the PFM of the HXMT satellite. The HXMT team reported on the R&D of the satellite PFM and the final design of the satellite. After discussing and reviewing the documents, the panel concluded that all the technical specifications met the mission requirements and the risk was under control. Prior to this review, the HXMT payloads and other segments had already passed the review. 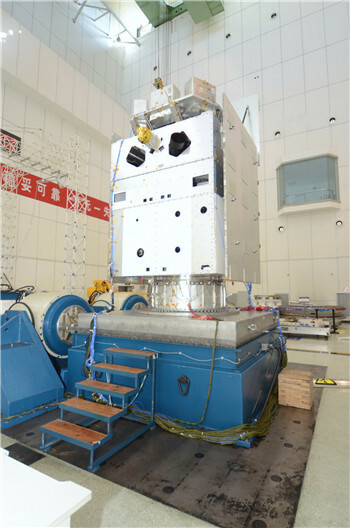 As China's first astronomical satellite, HXMT will perform an all-sky broad band X-ray survey and pointed observations. In the survey, about one thousand hard X-ray sources can be detected, while in the pointed observations some black holes and neutron stars will be studied in details. The HXMT project was officially approved in 2011 and will be launched in two years from now. As the scientific user of HXMT, the Institute of High Energy Physics leads the development of the payloads and the construction of the scientific ground segments. The China Academy of Space Technology is in charge of the satellite platform.